WordLock : Todd Basche invented the first Wordlock because no one in his family could remember number combinations. When he couldn’t find a Wordlock to buy, he just made one himself. Now, Wordlock products are sold in countries all around the globe. I received a WordLock in black, Word lock comes in the colors of red, black, pink and silver. WordLock has tons, and tons of different types of "Wording" locks besides the regular Padlock. They have Bike Locks, Luggage Locks, Big locks, Little locks, colored locks You name it they have it. But what the best part is instead of numbers they are letters! If you are like me you can't for the life of you use the evil number padlocks Ugh! I despise them with a passion. I always had to use the lock and key padlocks on my locker while in school because I would seriously be at my locker all day trying to get the padlock to open. Yeah not only is it frustrating, But it's embarrassing. Don't let your kids go through that humiliation! Get them a WordLock ! With 100,000 choices and you can choose your own Resettable word combinations you can't go wrong! The WordLock is the most durable padlock I have ever owned hands down. It's heavy but it won't weigh you down, and it's heavy duty shackle and 2 5/8-inch metal lock would be impossible to break. It's durability would be great for anything you want to keep safe. Put it on your door, Your refrigerator, Locker, tool box, your gate, safety box, or even your Gun closet. The uses are seriously endless. the different colors are great for kids or even adults. The price at just $ 8.99 is unbelievable! You can find WordLock at the following stores: Sears, Kmart, Menards, Bed Bath & Beyond, Fry's Electronics, Meijer, Northern Tool, Orchard Supply Hardware, Duane Reade, Bi-Mart, Big 5 Sporting gOODS AND aafes (Armed Forces Supply Stores) As well as select ACE Hardware, Lowes, CVS, Big Lots, HEB, Do It Best andTrue Value Hardware Locations. 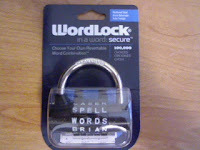 You can buy WordLock online at : Wordlock.com, Amazon.com, Kmart.com and Target.com. ♥ I receive no monetary compensation for this review. I was provided a WordLock to try and give my honest opinion.